Before moving into our new house, we took advantage of its emptiness and repainted every room. If you saw last week’s post, you’ll remember some of the rooms in our house were painted some pretty bold colors – a yellow dining room and a red and green kitchen. While I won’t knock bold moves in home décor, I wanted neutral colors to leave the interior design open ended. Hello Griege. I picked up some tips and tricks along the way and am really happy with how the house turned out, so I wanted to share four steps for picking the perfect paint color for your home. Check back later this week to see our painting updates. Before you paint you'll want to have an idea of your design end goal so you pick a color that jives with your style. When in doubt stick to neutrals. Here was some of my favorite inspiration. After finding your inspiration online you can narrow down your top contenders by using the undertones as a guide. The undertones in the floor boards are a great place to start. You'll need to know if your floors have warm or cool undertones and then you can match the warmth in your floors to your inspiration's. The undertones of hardwood floors are so much easier to tell than paint. See what I mean? Knowing that our floors were warm, I looked for paint that was shown in rooms with warm wood tones as well. This brought me to my standout paint color, Shoji White and helped me make a decision on three grays that caught my eye. I ruled out Aloof Gray because it was pictured with cool undertone wood and leaned towards Worldly Gray and Accessible Beige to sample. You'll also want to match the undertone of the paint swatch with the undertone of the wood. 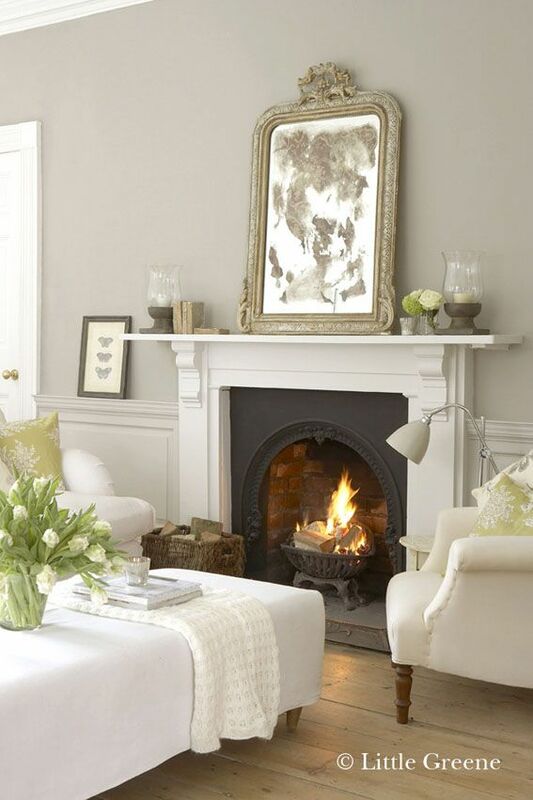 If you're looking at white paint a great tip for finding its undertone is to look at the swatches online. 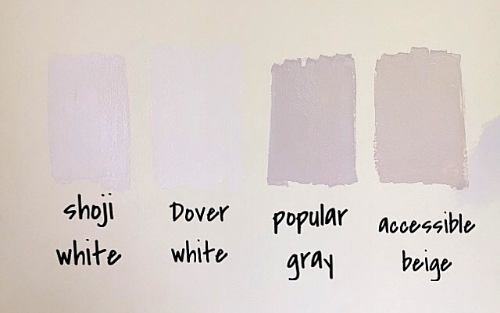 Following steps 1-2, I narrowed my choices down to Shoji White, Dover White and Divine White, World Gray and Popular Gray. Choose your sheen taking into account the purpose of the room and the level of wear and tear you can expect. Here's a quick guide starting with the most sheen and highest durability to no sheen and low durability. Once you've narrowed it down to a handful of colors, it's time to paint samples on the wall. A great tip to save money on brand name samples is to get a home improvement store like Home Depot or Lowes to mix the color for you. All they need is the color number like SW6071. Paint the samples on the wall so you can test that color in the actual room with the lighting. This part of the stage I changed my mind on some of the colors I was set on for certain rooms because they either looked too light or too dark in the room. Check back later this week to see what colors I picked for the house!